Dependence on such an unassuming, inanimate piece of metal, plastic, and glass is a frightening thing. Smartphones have the capacity to lure us out of any reality we experience with the guise of bringing us into an alternate one. Effortless Internet searches at a moment’s notice, along with mindlessly addictive games, and an influx of social media updates from our “friends” give us a break from the world around us. Many will constantly cite these as concrete evidence for why this is the worst generation to date. Although it may be easy for many to add to the list of reasons this technology is a detriment to Generation Z, is it really that difficult for us to recognize any upside? Or are we simply allowing a negative stigma to shroud us in blissful ignorance? Communication is now multi-faceted and faster than ever. There are an uncanny number of ways to connect with people throughout the world and it can be done with relative ease. Individuals, who grew up without a smartphone, now as ubiquitous as your wallet or keys, will blame its use for the rapid decline in young adult social skills and face-to-face interactions. It’s possible, however, that they neglect the other side of the coin. These same young adults are able to cast a wider social net that can continually expand without in-person restrictions such as travel. 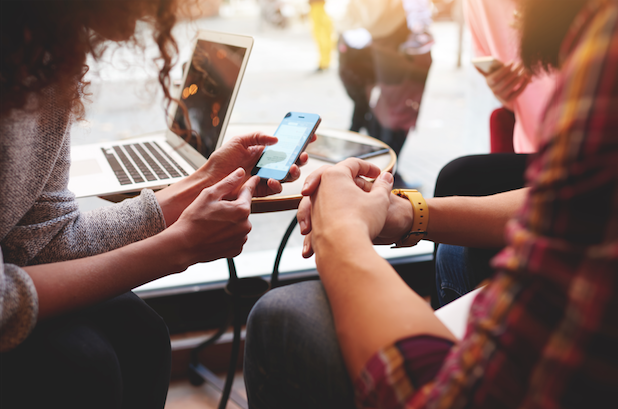 Interaction via smartphone is a way to network, to learn, to grow, and a means to foster relationships that can be further cultivated in person. For every senseless game or hackneyed social media platform, there are a dozen applications geared toward facilitating some other aspect of our daily life. We can manage our nutrition, regulate our diet, develop a fitness plan, and a host of other methods to monitor our health. For younger individuals, this can be efficacious in developing wholesome habits early on. Smartphones may take us out of the moment, but they can just as easily transport us into another one. We have never had more extensive access to media as well as news resources. Constant updates both domestically and globally keep us informed and involved by eliminating geographic distance as a factor. In minutes we can have access to more information than we know what to do with. Both passively and consciously flooding our minds with content promotes a cohesive understanding of a wider breadth of subjects. There are going to be upsides and downsides to any progression we encounter in our developing society. The important thing is to understand the value and avoid having the negative cloud your judgment. Yes, there are some glaring issues with our smartphones glued to our hands, but put this into perspective. It is a relatively new technology that has exploded in the last decade. Our technological boom is still a novelty we are incorporating into our daily lives. Acknowledge the potential shortcomings, but do not let them overwhelm the myriad improvements to our lives the technology promises. Eventually, the allure will wear off, and the stigma will fade as we trudge onward into the future.